Playing Keno online is an exciting pastime, it can be played in the virtual environment via any online casino you choose. Online keno games have basically the same odds and rules as more usual Keno. Each time the player starts the game, he chooses a minimum of 4 or a maximum of 10 numbers between 1 and 80. These selected numbers are called ‘spots’. Once the choice of numbers has been made, the Keno machine will randomly select 20 numbers and the result will be displayed on Keno boards. The objective of the game is to match all possible numbers. Apart from the numbers, the player can also choose the wagering amount. The bets in online keno games can be very low, while payouts can be sizeable. Payouts are determined by how many numbers have been chosen and how many numbers have been hit, then multiplied by the proportion of the gamer’s wager to the base rate of the paytable. A good betting scenario: more numbers chosen and more numbers hit result in higher payout. 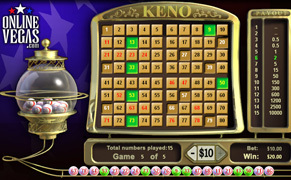 Keno online is extremely simple game to play. The first thing you need to do is to choose the amount of the wager you want to make. The coins amount equals your account and the denomination of coins. You can place a wager with BET ONE or the BET MAX buttons. And if you choose BET ONE button, you will bet one coin per game and with BET MAX you can bet four coins per game. You can increase or decrease the wager amount by pushing either Increase (+) or Decrease (-) buttons. After you chose the sum you want to bet with, choose the lucky numbers. After you chose the amount of bet, choose the number between 1 and 10 that you like or that you consider your lucky numbers by clicking on the chosen number in number grid. After all numbers have been chosen, you choose the quantity of games you want to play consecutively with those numbers. You can do this with the buttons either PLAY ONE, or PLAY FIVE,or PLAY TEN. You will play the game just once if you push PLAY ONE, with PLAY FIVE you will be able to play the game 5 times in a row, and PLAY TEN allows to play the game for ten times in a row. Then, pushing the Play button will cause 20 of numbered keno balls to come out of Keno number machine. Numbers that won will have colour different from other balls on the board, and table of the payoffs to the left on your screen will light up informing you of your winning.